Forget gourmet cuisine, Michelin-star food adventures. Forget about being served a few carrot strips with a bisque and pumpkin flavored ice cream, all for the not-too-paltry sum of a couple of hundred notes. There are greasy food adventures to be had. Most Brits love a traditional English breakfast. In fact, the Full English is one of the most popular breakfasts in the world. As it spreads across the globe, largely via expats and hotels/restaurants catering to expats, the Full English Breakfast is also becoming the focal point for a lot of health nuts. Health experts are telling Brits what they should and shouldn’t eat for breakfast, and how much of it to eat. The owners of greasy spoons up and down the country aren’t paying any attention to that, though. 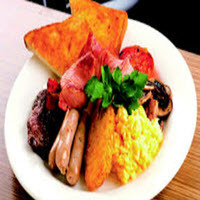 In fact, the Full-Full-Full English is now one of many food adventures that die-hard fans of this breakfast can now enjoy. What’s in a Full English? Lacking a proper name, what we call the Full-Full-Full English is a monster meal. Enough food for 2 or 3 days (sometimes more), these behemoth breakfasts are seen as more of a challenge and competition than a true food binge. So, what is the challenge and what kind of adventure are you likely to have taking it on? For starters, the average Full English will have a few rashers of bacon, a couple of sausages, a fried egg (or two), hash browns, mushrooms, baked beans, toast, fried tomatoes, and possibly some black pudding (blood sausage) if you’re so inclined, typically costing under a tenner. Not bad for a breakfast worth over 1,500 calories. This hearty meal should see you through most of the weekend, which is when Brits tend to eat it. However, the Big Breakfast has now become the focus of many restaurants who aim to fill their tables with eager and food-loving competitors who swear they can take down a monster. 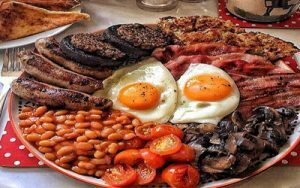 Four slices of fried toast, four large eggs, six pork or beef sausages, six strips of bacon, hash browns, slices of black pudding, baked beans, mushrooms and fried tomatoes. Britain’s Biggest Breakfast. The cost, £20, and the venue? The Wonder Café in Hillingdon, near London. If you can eat the whole lot in 45 minutes, it’s yours on the house. Believe it or not, it has been done – once. Emma “the Human Hoover” Dalton managed to wolf down the 4,000-calorie behemoth live on This Morning, in a cool, calm and collected twenty-one minutes and thirty-four seconds. Other venues offer similar challenges up and down the country. There is even a 9,000-calorie beast known as The Monster available in Rochdale’s Castle Café, although admittedly that offers up burgers and chips/fries, too. Whilst many doctors will tell you to forget about this food adventure, it is something that many people find fascinating. Why stuff your face with red-hot chilis and spicy sauces in competitions, when you can eat your favorite breakfast (possibly for free) in one of Britain’s most loved and delicious food adventures?